Neck pillows aren’t just for those who travel on long trips in planes or in cars. They are for anyone who has ever awakened with pain and stiffness in their neck and back. A supportive pillow that cradles your neck is a great addition for everyone, no matter which sleeping positions you find most comfortable. In this article, we will discuss the health ramifications of having a neck pillow that isn’t supportive enough and how one goes about buying a better one. Once that is done, we will end with reviews for the best cervical pillow for neck pain, so you will want to keep reading. A lot of health problems occur when you use an unsupportive pillow. Morning neck pain, stiffness, and even numbness are common. In the following sections, we will discuss some of these issues in depth. Get ready to discover whether your pillow is the culprit for your ailments. If you’re the kind of person who sometimes wakes up with a really bad headache in the morning, it could be your pillow. Unsupportive pillows can lead to tension in your neck. Neck tension, of course, leads to neck pain. When your neck aches, it tends to make your head ache. Why does this happen? The answer is rather simple. At the base of your skull, there are four pairs of muscles, known as the suboccipital muscles. These muscles control subtle movements between your head and the first couple of vertebrae of your back. An unsupportive pillow causes these muscles to tighten and tense. The tension sends pain signals to your brain. The pain of this kind of headache tends to feel like a band is wrapping around your head and constricting. However, the muscle tension is not the only problem. An unsupportive pillow, and the bad posture it causes, can create a headache in another way. The nerve which comes out of the base of your skull can be compressed by the suboccipital muscle tension. This then, of course, sends pain signals to the brain to let you know something is wrong. Your spine should remain straight. When it doesn’t, either to a sagging mattress or an unsupportive pillow, problems can begin to occur. Bad spinal alignment can lead to chronic back pain. It can also lead to slipped discs and other painful back injuries. If a vertebra slips, the muscles will tighten, causing tension. This tightening also affects the nerves which service your organs, meaning that your brain’s vital signals can be interrupted. The final problem that a misaligned spine can cause is numbness. The spine, as you know, protects the spinal cord. Misaligned vertebrae can actually compress that bundle of nerves. When this happens, nerve impulses to your extremities can be reduced or blocked. This can lead to arm and leg numbness, or other damages if it continues long-term. If you have neck pain in the morning, you’ve probably dealt with insomnia before. Insomnia can do more to your body than just making sure you don’t get your beauty sleep. The stress caused by insomnia can literally cost you a loss of productivity at work. It can also cause absences, slowed reflexes and impatience with co-workers. As a working person, this is something you do not want to happen. Which pillow should you buy? 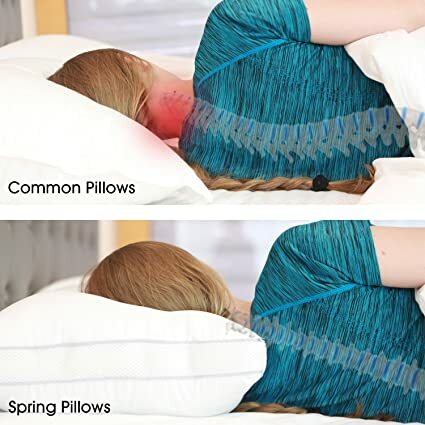 If you have dealt with chronic neck pain for any time at all, then you know that there are a seemingly infinite variety of pillows out there, and all of them promise to alleviate or get rid of neck pain. Contrary to those claims, there is not one pillow out there that is perfect for everybody. You must take a few different factors into account before picking your pillow. If you suffer from allergies or asthma, make sure you pick a pillow that is hypoallergenic and allergy-free. Latex and memory foam are both good options for this kind of neck pain pillows. However, feathers are not. Neither is any pillow which can get dust mites. These creepy crawlies can make your allergies or asthma worse. A pillow’s job is supporting the head. If it is too flat, it does not adequately fill the gap between your shoulder head, neck and back. If it is too high or fluffy, it will stretch the muscles of your neck instead. This can lead to neck tension and pain. Another reason you want a fluffy pillow is that it allows fresh air to flow through the filling. 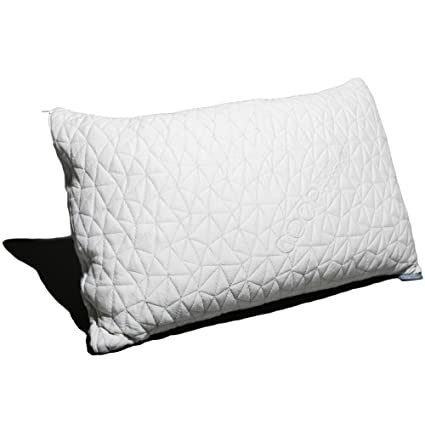 The fresh air will keep your pillow cool, as well as preventing it from mildewing or molding. Side, stomach, or back sleepers all require different types of pillows. For example, if you are sleeping on your side, you will need a pillow that supports your back. Sleeping on your stomach requires a very thin pillow, almost flat. This is the worst sleeping position for neck pain. However, if you can’t sleep in any other position than on your stomach, you can sleep without a pillow under your head and just put one under your stomach to prevent misalignment of the spine. There are pillows best suited for each type of sleeper, but not all are created equally. Look out for pillows made of more durable materials. They will still need to be replaced, but they will last longer and hold their shape better than cheaper ones. Now that we have covered the basic considerations of buying a pillow, let’s take a moment to touch on all the various types. This way you will learn which type is right for you without having to find out by trial and error. Memory foam pillows are awesome. They come in two types. The first type of memory foam pillow is the solid foam pillow. Just as it sounds, this pillow is made of a solid memory foam. These pillows will conform to your head and neck in just a few seconds, which makes them the perfect pillow to relieve neck pain. There are downsides, however. Solid foam pillows are often hot, and can be quite expensive. That’s where the second type of memory foam ne k pillow comes in. These are made of shredded memory foam. They still will conform to your neck and head. However, the shredded foam is much cooler and less expensive than its solid counterparts. Cervical pillows are orthopedic pillows that support your head, neck and upper back. They also tend to align your extremities. They are commonly used as long-term sleeping aids after an injury to prevent the symptoms from reoccurring. This pillow for neck support is named after the cervical, or topmost, vertebrae of the spine. Contour pillows are great for side and back sleepers. They curve down to support the back and cradle the neck. This interesting shape will also keep your airways open. An open airway will reduce snoring, allowing you to get a better night’s sleep overall. 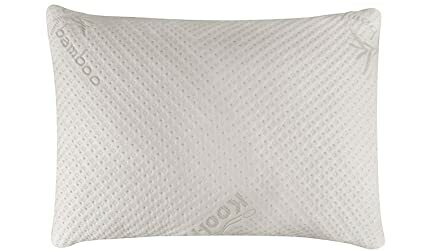 A water-based pillow is one that is breathable polyester on top. However, the bottom section is filled with water in an attempt to provide a pain-free sleeping surface. These pillows are both cool and breathable. Since they are heavier than a normal pillow, they don’t move around as much. They will cradle your head and neck, aligning your spine and properly supporting muscles. However, there are some downsides. These pillows do not work well for stomach sleepers. Furthermore, they are a bit more expensive. Roll-shaped pillows serve a wide number of purposes. Not only are they good for putting behind your neck if you sleep on your back, but this pillow can be put under your stomach to align your lower back. Furthermore, you can tuck them under your knees or ankles as well. They even make good back cushions for sleeping on those long trips. A roll-shaped pillow can be an excellent neck support pillow. They tend to be wide and soft, and filled with a breathable fiber fill. All of these pillows are good options. The trick is finding the one that works best for you. Now that we have showed you what types of pillows there are on the market, as well as what you need to look for when buying a pillow to relieve neck pain, it’s time to review a few of the best options on the market. These are our picks for the most useful bed pillows for neck pain. If you have allergies, as well as neck pain, this pillow will be perfect for you. It’s a shredded memory foam pillow which can be fluffed to adjust the loft to work with your sleeping position. Furthermore, the shredded foam construction of this pillow means that it will breathe. Fresh air can flow through the memory foam so your head stays cooler. 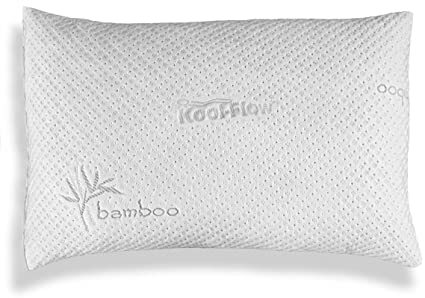 To aid in the cooling, this pillow also includes a bamboo-derived cover. Bamboo is much softer than cotton, and it stays much cooler than cotton as well. The memory foam pillow keeps your head neatly aligned with your back. This proper posture means that the pillow helped reduce neck pain. If shredded memory foam doesn’t work for you, there’s a new contender on the neck pillow market. This is the spring bed pillow. As the name implies, this interesting new pillow has forty pocket springs, just like a tiny mattress for your head. This pillow is great, no matter what position you happen to wind up sleeping in. The pocket springs ensure that it is always supportive. Prepare to find your neck and back pain melting away as you wake up much more refreshed. There is only one downside to this pillow. You can’t launder it. Instead, put a dust mite-resistant cover on it, and a pillow case. Fluff it regularly and if it gets wet, sun dry it. This may be the best pillow you have ever purchased. Snuggle-pedic pillows are stuffed with shredded memory foam. However, unlike regular shredded memory foam, these are tiny, soft pieces, which also makes the pillow lighter and more resilient. If you are looking for a pillow to avoid neck pain, this one has you covered. It contours nicely to your head while still supporting your neck. The Snuggle-pedic pillow will work well for most people. However, if it doesn’t work for you within the first ninety days of your ownership, the company will take it back and customize it. For once, you can have a pillow which meets your exact specifications. This shredded memory foam pillow is resistant to dust mites and hypoallergenic. No longer will your quest for neck pain relief involve waking up with a runny nose and itchy, watery eyes. Unlike most pillows, this one also regulates temperature. No longer will you have to worry about mold and mildew growth due to sweat and other moisture collecting inside your pillow. The foam inside this pillow will never go flat. It retains its shape, night after night and sleep after sleep. It comes rolled flat. Simply cut away the plastic, unroll and fluff. Finding a pillow that will help with your chronic neck pain can be a harrying proposition as you try pillow after pillow, night after night. However, it doesn’t have to be. Now that you have read this article, you likely have a better idea on which pillow to choose, as well as what to consider before you make that all important step. Never again will you have to spend another night in agony, tossing and turning with your neck getting stiff, tense and painful. Prepare for happy sleeping.